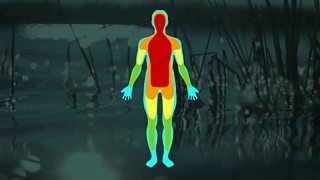 BBC Two - Trust Me, I'm a Doctor, Series 7, Episode 3 - What is Raynaud Syndrome and what can I do about it? Up to 10 million people in the UK are thought to be affected by a painful and potentially disabling condition that often goes unrecognised: Raynaud Syndrome. For someone with Raynaud’s, a modest drop in temperature can cause their fingers and toes to become extremely cold and numb, making simple tasks like fastening up a coat impossible. It can also be extremely painful. However, many people with the condition simply put up with it, without seeking treatment. Normally, when we’re exposed to cold, our blood circulation changes. To help us conserve heat, the blood vessels in our hands and feet narrow. This reduces blood flow to the extremities of our body and helps keep our vital organs warm. But in someone with Raynaud’s, the blood vessels are hypersensitive, and shut down with even the mildest drop in temperature. As well as shutting down more readily, the blood vessels will also take longer to re-open fully. When they do, the blood returning to the fingertips causes pain. The symptoms of Raynaud’s can be triggered by other factors that affect the circulation: anxiety, stress, or simply gripping a heavy bag. For 1 in 10 sufferers, the condition is a more serious type called Secondary Raynaud’s. In this case it is caused by an underlying disease or injury that has permanently damaged blood vessels or nerves. Causes include some autoimmune diseases, vibration damage or smoking. It can also be a side-effect of many common medicines, so if you think you may have it, check with your doctor. So how can you spot if you might have Raynaud’s? One common sign is if your fingers change colour when you are cold. They may go white, or even blue, and have a waxy texture. To improve your circulation - quit smoking, and exercise regularly. To avoid pain - wear gloves, more than one pair if it’s cold; put on your gloves before you go outside; once you are outside, keep moving to increase your circulation. Sometimes medication can be prescribed to help manage Raynaud’s. The most effective drug for this is one famous for a very different purpose: sildenafil, often sold under the brand name Viagra. Currently there are no reports of widespread unwanted side-effects among sufferers of Raynaud’s treated with sildenafil. There are effective treatments for Raynaud’s, and it could be a sign of a more serious underlying problem. So if you think you might have the condition, see your GP.